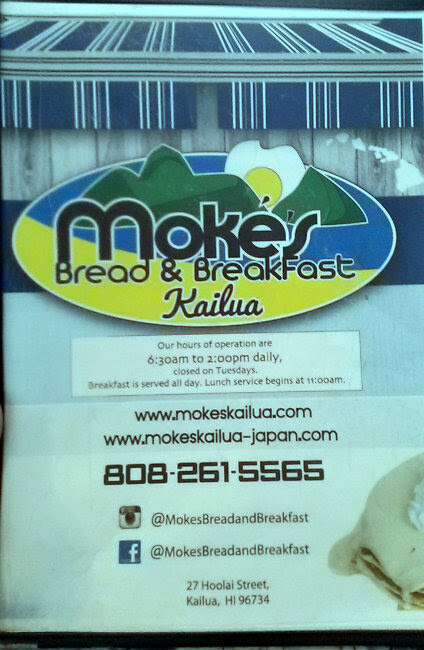 Moke's Bread and Breakfast is located on Hoolai Street in Kailua, Hawaii. 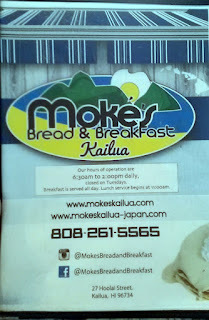 Searching for a solid breakfast option took me to the Windward side. 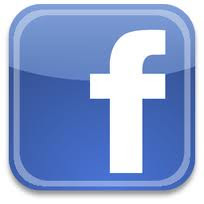 You'll also see a large number of tourists in this area; lots of shops and places to eat. 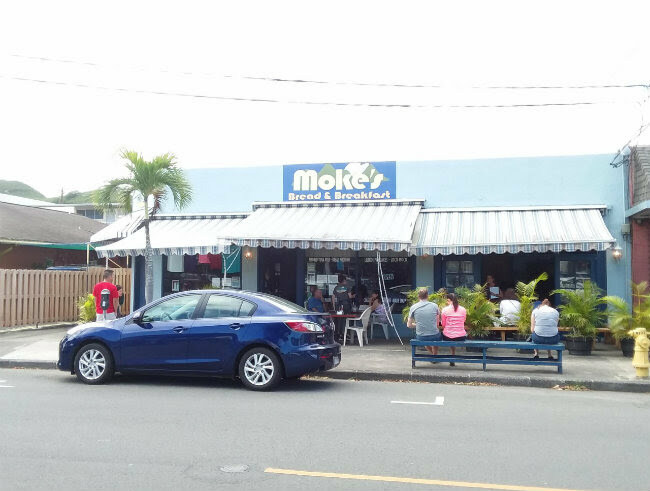 On a weekend, the brunch wait time at Moke's can be around 30 minutes. Street parking is mostly metered, and while there are parking lots, I wouldn't recommend that, for fear of getting a ticket or getting your car towed. 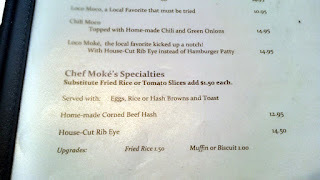 Moke's serves breakfast all day. The usual American breakfast options are there, from bacon and eggs to omelets. 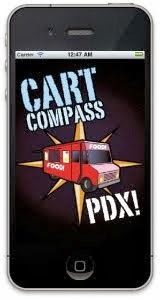 Lunch starts around 11 and consists of sandwiches and soups (including their homemade chili). 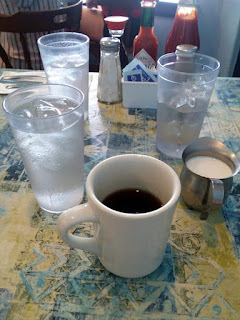 As usual, I started with coffee. They have their house (medium) roast or a light roast, and went with the former. Good coffee here, and unlimited refills. 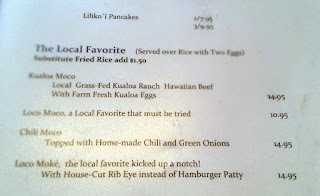 Since I'm more a breakfast guy, I had to try the lilikoi pancakes (2 for $7.95) and their homemade corned beef hash. I loved the pancakes, some of the fluffiest I've had in a long time. 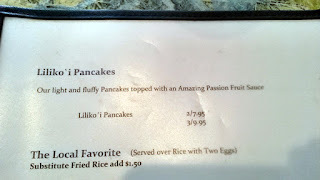 I personally thought that was too much lilikoi sauce on top; I would have been fine with half the sauce, perhaps spread around the outside of the pancake and a little on top. 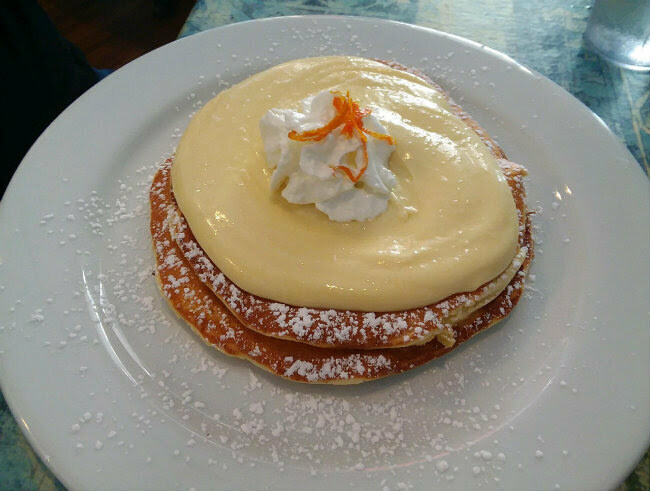 The orange zest with whipped cream was a lovely touch. The corned beef hash, listed under Chef Moke's Specialties, came in a circular patty, with two eggs and toast. I upgraded to their fried rice for $1.50 more. 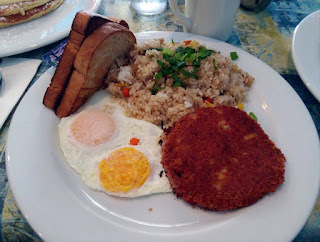 The hash reminded me of how my grandmother made her corned beef hash for me. 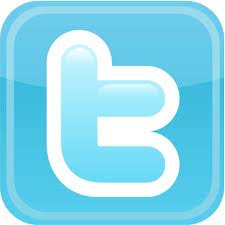 Wonderful eggs. For me, I could have had a bit more soy sauce or garlic in the fried rice. Sriracha would have also been ideal for me. The wheat bread was fantastic. 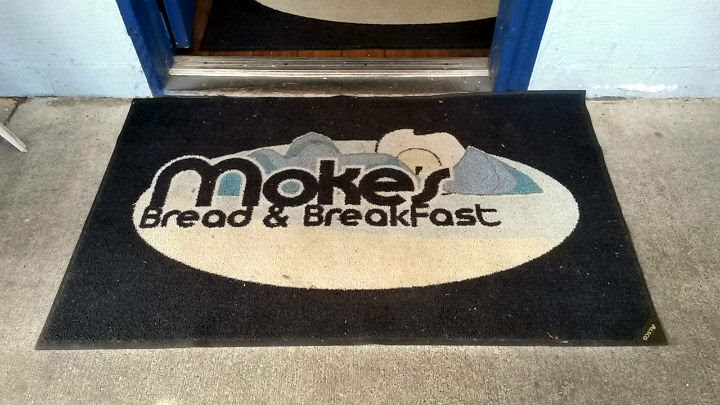 As the restaurant name implies, Moke's also makes their own bread and sells them for $6 per loaf. Choice of white, wheat, or rye bread. 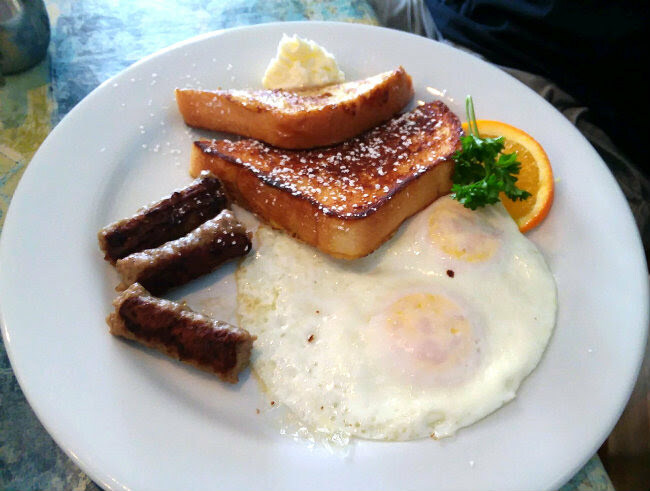 My dad enjoyed his French toast, link sausage, and eggs. Decent portions here, nothing too large or too small for most people. I also saw people ordering Eggs Benedict, but I did not see it on the menu. 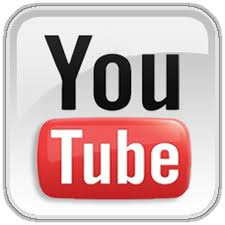 It could have been a special, or I simply didn't see it. 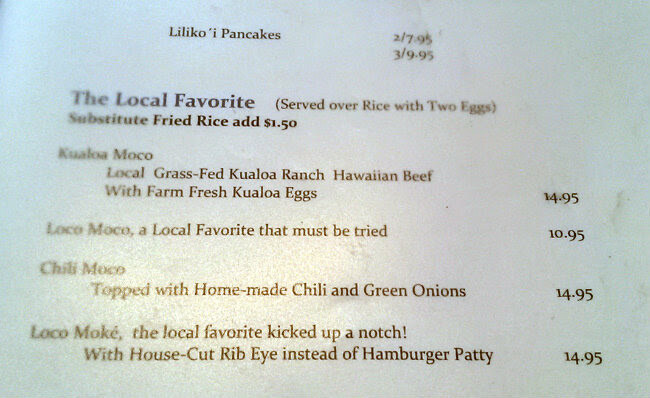 Next time, I may have my eyes set on their version of a Loco Moco. 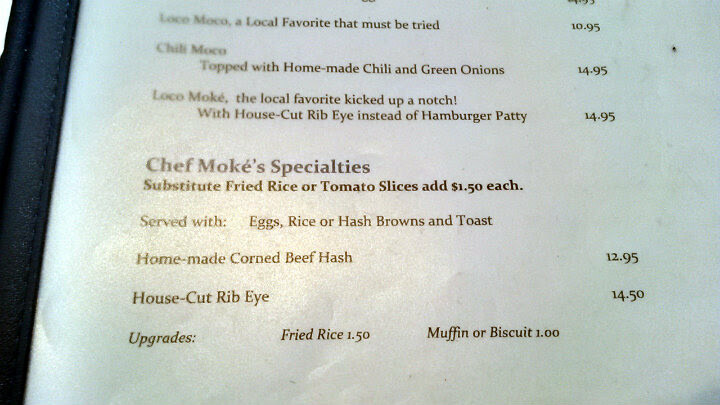 The "Loco Moke" ($14.95) uses a house-cut ribeye instead of a hamburger patty.